Are the projects loading correctly? Ok, the projects load up fine, I can go in and mess around with them etc. Can you paste out the errors that are thrown out by the compiler? I vaguely recall dealing with an "LNK2001", but I'd need to see all the stuff in order to really trigger my memory. Josh -- what version of the Visual Studio editor are you using? Are you building the Transcendence solution? Or the Transcendence project? 1. 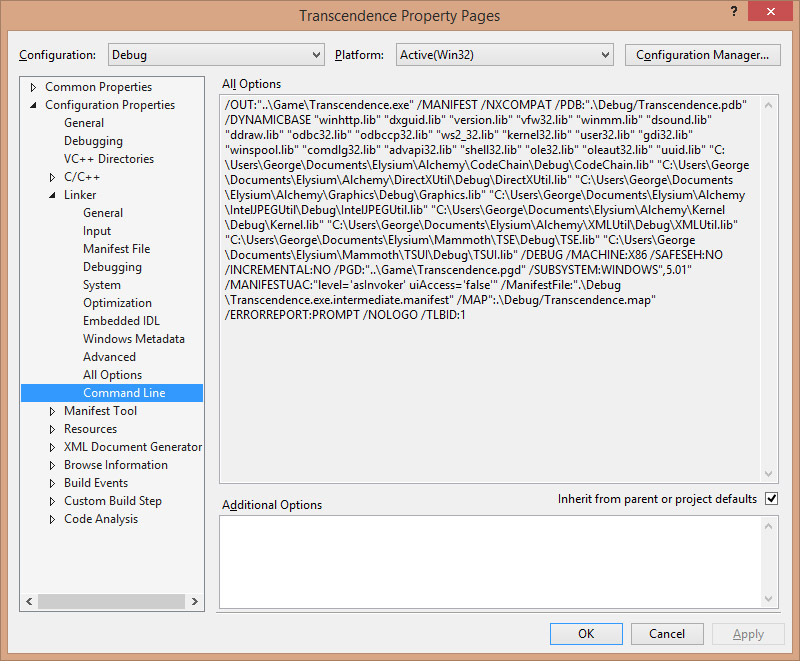 Get Properties for the Transcendence project. 3. 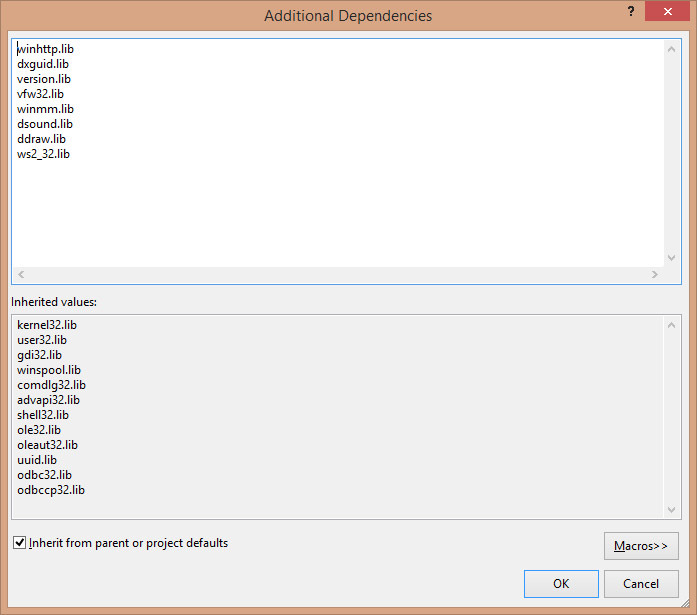 On the right-pane, click on the field for "Additional Dependencies" Click on the down-arrow and select "Edit..."
Notice that kernel32.lib, user32.lib, and gdi32.lib are listed in the "inherited values" section. Also notice that the "Inherit from parent..." checkbox is checked. If you see something different, let us know! So I'll leave you and George to it. Can you comment on George's question? josh19967 wrote: Notice that kernel32.lib, user32.lib, and gdi32.lib are listed in the "inherited values" section. Also notice that the "Inherit from parent..." checkbox is checked. If you see something different, let us know! The unresolved externals in your list are all Windows APIs. Most are in user32.lib or kernel32.lib or gdi32.lib. Could you post what yours looks like? Oh.. by the way, I'm running a 64-bit OS. what the heck? it compiled? Why did you make the change that you made? I'd like to document it/understand it in case someone in the future runs into the same issue. Not too helpful, I know, but I tried.